A spacious and refined housing combined with an entirely personalized hotel experience which brings you up to new standards. 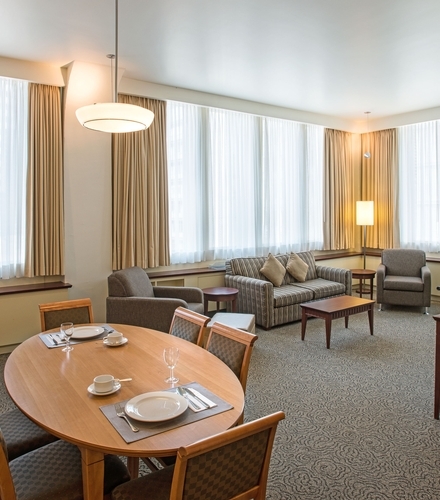 Located only a few steps away from L’Astral and from the famous Place des Festivals stands proudly the Square Phillips Hôtel & Suites on Place Phillips Street. The original building is a fantastic historical monument made with the help of renowned architect Ernest Cormier. The building has since been restored and harmonized with the most recent designs to serve its new mission. You can now find 164 splendid studios, rooms and suites with the goal to make the visitors a new state of the art lifestyle in downtown Montreal. You can find an indoor pool, a gym and the great terrace on the roof of the building that gives us a unique look on the Square Phillips and the city of Montreal that will make you remember your trip for a long time. The hotel graciously offers the breakfast to all its customers, that you can eat in the private lounge or take out and savour in the intimacy of your room, or even on the go while you visit the city. Either you are you a business trip in Montreal or here because of the many appeals of the second greatest French-speaking city in the world, with Square Phillips, you are only a few steps away from reaching some of Montreal’s most prestigious addresses and also the entertainment offer of the area with Le Quartier des Spectacles and La Place des Arts. A visit at the Square Phillips hotel means comfort, luxury and well-being. The hotel is mostly renowned thanks to its immaculate name in the industry. Square Phillips hotel is quality establishment in downtown Montreal that offers proximity to famous attractions only a few steps away. 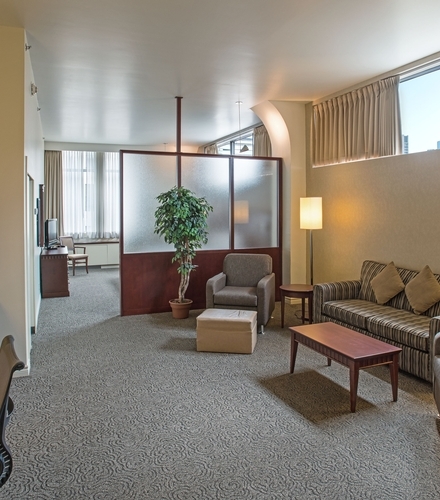 Visitors like Square Phillips hotel because of its spacious rooms, studios and suites. They also benefit from several additional services that redefines their way of housing while on a trip. The conveniences offered by the hotel include the heated indoor pool and access to the great terrace on the roof. You can take your time to take a breath of fresh air and enjoy the marvellous view of the city of Montreal and all its lights. The architecture and antique style of the hotel blends perfectly with the modern style of the indoor spaces, which adds a unique feeling to your hotel room. 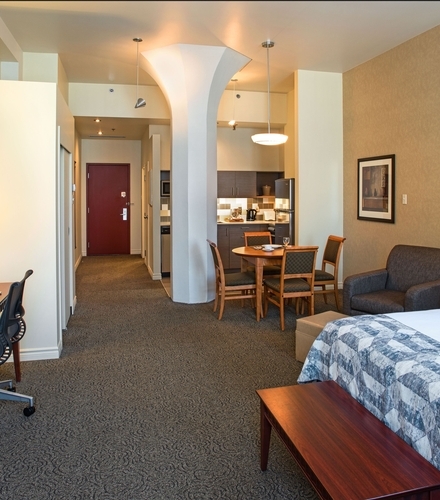 When you go out on a trip, you should treat yourself with the best quality of accommodations in downtown Montreal with an hotel that will provide an unforgettable experience!